We hope to see you soon at this first-class Clarion Hotel right next to Copenhagen's main airport, a place where the whole world convenes in an international space filled with art, music and food. Located just 2 minutes' walk from Terminal 3, Copenhagen's international hub, you can certainly save valuable time when you stay here. The hotel is also within walking distance of Terminal 2 for other flights and CPH Go for low-price carriers. Enjoy excellent communications to and from Copenhagen, with a metro station located under Terminal 3. You'll therefore be ideally situated to explore this fantastic city! The Öresundståg train network can also be easily accessed from Terminal 3. Experience 29 bright and flexible conference and meeting rooms that can accommodate anything from 4 to 500 people. 14 of these meeting rooms have recently been refurbished and are conveniently located on the 4th floor at Terminal 3. With the airport, E20 motorway and the metro right on the doorstep, this is the ideal venue for spontaneous meetings, as well as week-long conferences with participants from all over the world. Find out more about our conference and event facilities here. 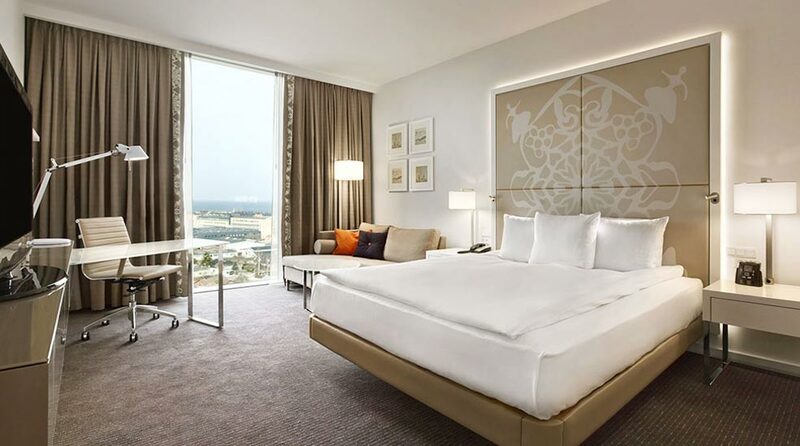 Enjoy 383 spacious rooms featuring modern Scandinavian décor. Our smallest rooms are actually the biggest ones in town at 33 sqm, and they feel bright and airy thanks to fabulous floor-to-ceiling windows. Regardless of whether you're looking for a luxurious suite, a simple room for an overnight stay or somewhere to bring your whole family, the Clarion Hotel Copenhagen Airport has a great range of accommodation. Read more about our hotel rooms here. Later this year we will be opening our restaurant concept, Kitchen & Table by Marcus Samuelsson, here at the hotel. Join us on a culinary journey that perfectly unites Nordic ingredients and local traditions with flavours of Manhattan. Enjoy world-class dishes created by one of Barack Obama's favourite chefs and sample what we like to call "Fun Dining". We look forward to welcoming both hotel guests and others who are interested in this exciting mix of flavours! In the meantime, we will be serving high quality food and beverages under another concept. A morning workout or a dip after a long day? Our gym is open all day, and our spa and relaxation area offers a heated salt-water pool, aroma steam room and six treatment rooms. Please note that children under 16 may not access the spa and pool area. Read more about the spa and gym facilities here. Those of you who prefer to exercise outdoors will find a good range of routes right on the doorstep, including beach trails along the Öresund coast! Nordic Choice Hotels has been working with UNICEF since 2008. Together with our guests, we help children in Cambodia at risk of human trafficking to get a safe night's sleep. Human trafficking is the next biggest criminal activity in the world, affecting more than 1.2 million children every year. Our "Sweet Dreams Stay" project involves hotel guests choosing not to have their rooms cleaned in exchange for us making a donation of 10 kronor to UNICEF on their behalf. All they need to do is to hang the Sweet Dreams Stay sign on their door before 11pm the night before. This project ensures that children get a safe place to sleep, and the care and opportunity to go to school. Welcome to the Clarion Hotel Copenhagen Airport – Copenhagen's main meeting place! You can reserve a table at our restaurant here. Take line M2 from central Copenhagen to Copenhagen Airport (approx. 10-15 mins). Then walk through the passageway straight into the hotel lobby. Walk through the passageway from Terminal 3 and straight into the hotel lobby (approx. 2 mins). Please come to the reception and we will gladly book a taxi for you. If you are not at the hotel, we recommend you to book with Taxi 4x27: +45 27 27 27 27. Read the Smiley report here.